All I have to say is very amazing work. Thanks for this tuto. I've planned to do one diorama, but it's notre easy ! Wow! That is an awesome picture! Gorgeous lighting and works I have to say. Can't imagine how much effort you put behind this photo. Very impressive ! Impressive Diorama you build for this photo shoot. And the final results looks great. Love the wolf skull you used in your diorama. Your pictures are really beautyfull. The color is probably a personal preference, but I believe i tweaked it that way so that it looks more consistent with Jibril's brightness/exposure level. Try imagining the skin brightness level on the right picture and the hair color and exposure level on the left side and it will look a bit inconsistent. I raised the luminance amount in Hue/Saturation/Luminance slider under purple and magenta color channels. On the Hue and Saturation aspect i did only slight tweaks. Oh, thanks! 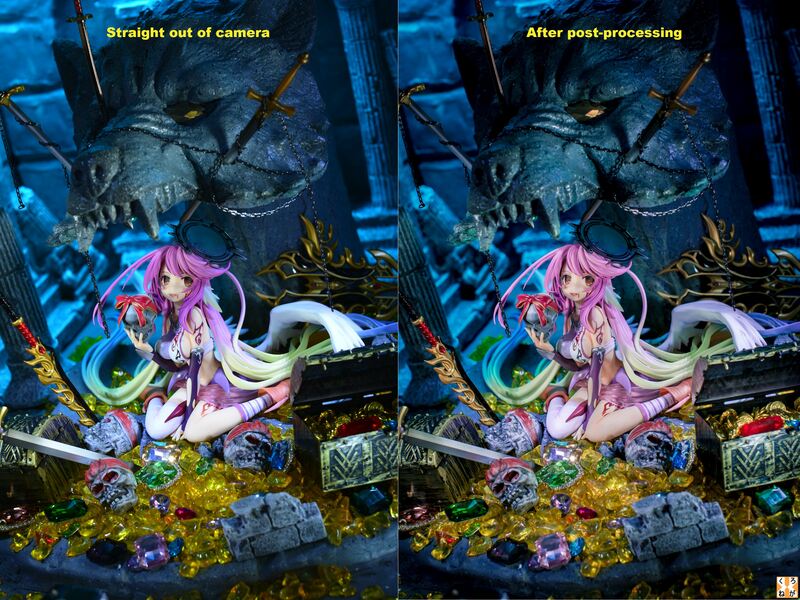 And yeah lotsa things are subjective, but the processed one does look better overall. Mekuneko (Vor 1 Jahr) #26523011Nice job once again! One comment though, I think I'd like to see the straight out of camera and after post-processing pictures little larger because they are very similar. I can see some of the shadows brought up nicely as well as the skin tone (after processing), but I like the original purple hair in the first picture. Was there a reason to change the hair as well?